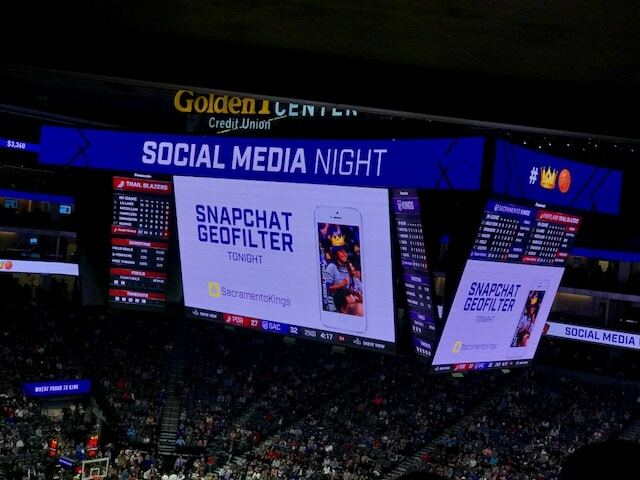 Being at Golden 1 Center during the Sacramento Kings social media night as an industry expert on behalf of Panasonic was an ultimate fan experience I will never forget, thank you. Downtown Commons (DOCO) features the NBA’s most technologically advanced and sustainable venue. The Panasonic Solutions Group and I were given a private tour of the arena by team executives. I then conducted interview sessions with team management and a Panasonic executive. To end the evening, I hosted a Facebook Live from the Panasonic USA Facebook page during the game against the Portland Trail Blazers taking place on David J. Stern walk. The crown jewel of Golden 1 Center is the league’s first Ultra HD LED video board measuring 84-feet long. The massive 4K display was custom built for Golden1 by Panasonic and features social media fan generated content on the four large screens displaying at four times the resolution of home entertainment centers because of more than 37 million pixels. 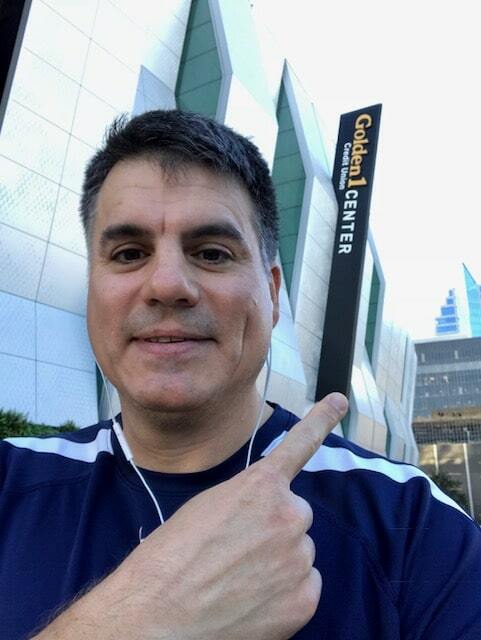 I was honored to represent the Sports Techie community blog during my stay at the Sawyer Hotel Kimpton next door to the facility and during gameday at Golden 1 Center, a true sports tech mecca. I witnessed firsthand why the game is never out of sight because of Panasonic technologies. Sports leagues and teams are faced with the reality that sport fans are comfortable viewing games in their house, at work or a sports bar rather than attend a live sporting event. Some of the reasons for this might include, tickets being too expensive, parking and traffic hassles, costly food and beverage, and pricey team merchandise, all adding up to more than the average fan can afford or is willing to spend. To counter these objections, the atmosphere at Golden 1 Center is designed to be a super fun combination of excited Kings fans, killer advanced technologies and engaging marketing programs aimed to make the spectacle inside the cutting-edge facility a truly unique outing you simply cannot match watching from your couch. This Kings social media night featured mini-pig Hank, custom emojis and interactive social cutouts. 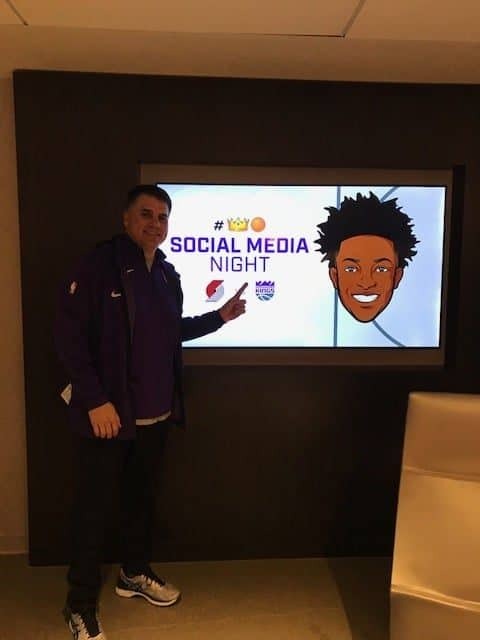 The Kings social media-themed programming also included a first-of-its-kind hobby horse race, toddler fox trot, Kings Cruising Karaoke with Doug Christie and animoji lip sync challenge. The digital fan experience outside the arena begins with two extra-large 42-feet wide by 25-feet high LED Panasonic video displays greeting visitors with clips, animations and graphics, social media and targeted marketing messaging. 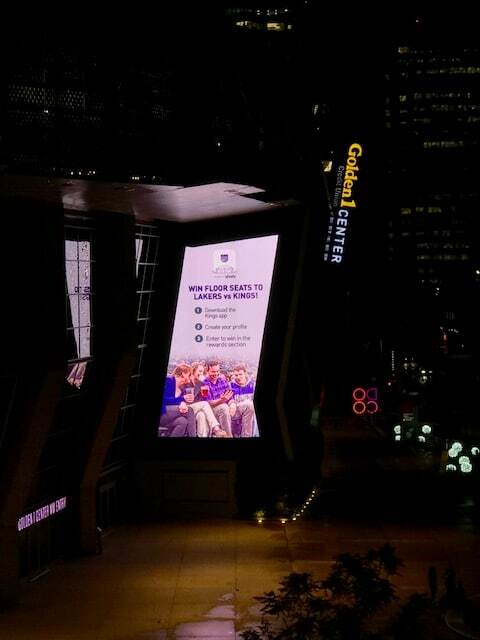 The first night of my stay, I took an iPhone photo of a fan reward contest displaying on one of the XL outdoor screens promoting the upcoming rivalry game against the Los Angeles Lakers. My tweet and this image was retweeted by the Kings and the Sawyer Hotel handle ‘liked’ it on Twitter as it was shot from their amazing swimming pool deck overlooking Golden1’s plaza. Thanks! The next day, I jogged around the building to get a look at the scope of the grounds then ran along the Sacramento River trail and back through Old Town. The last time I was in Sacramento was 1994 with a political science class from Whittier College. 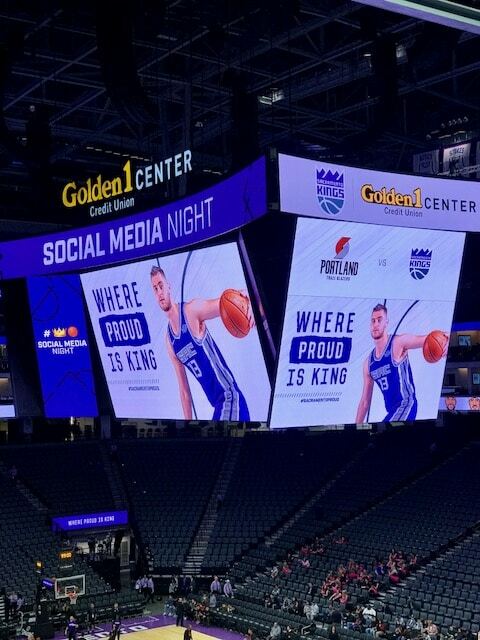 Being at Golden 1 Center during the Sacramento Kings social media night as an industry expert on behalf of Panasonic was an ultimate fan experience I will never forget. The Panasonic team met in the Sawyer’s main foyer to meet and greet each other. There were two representatives from Japan, a host of Panasonic USA’s management team and super kind Kayla Holmes, a Text 100 Consultant. The tour got started at the VIP entrance where we met with Scott Monaco, Producer and Director, Ian Wheat, Innovation and Technology Manager, and Tess Hyer, Partnership Marketing Coordinator, for the Kings. The people representing the Kings and Golden 1 Center were completely transparent about their technologies during the entire tour. In this day and age of secrecy and rights, we were not required to sign NDA’s nor were there any restrictions on what we were able to see as a group that I was aware of. VIP security check-in featured a custom built ticketing system that makes entering Golden 1 a non-obtrusive and fan-friendly breeze. 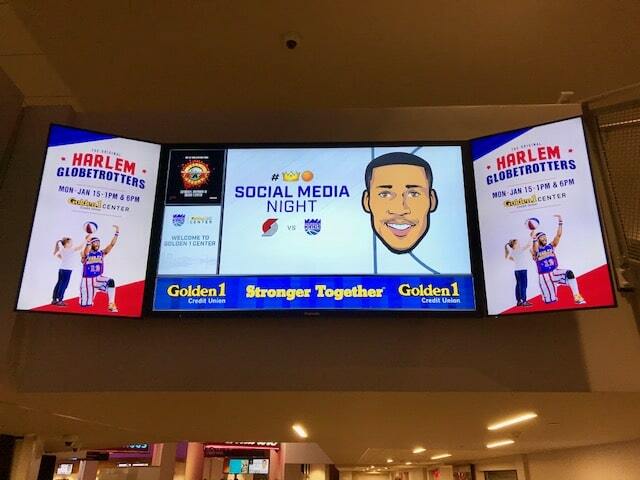 Right away, 700 Panasonic HD Pro monitors installed throughout the arena concourses and suites were in full display here and throughout the spectacular venue displaying digital signage, enticing social media night fan generated posts and targeted brand messaging by partners. Our first stop was the Data Center and the fully integrated Control Room. From the Control Room, the staff can manage the entire networks of Panasonic displays and more. Traffic data is distributed here to Waze and Google Maps platforms in real-time to ease traffic flow. The Kings have a cutting-edge mobile app or remote control series optimized for the fan experience that runs on the custom designed Lava platform hosted in the cloud and integrated with the Control Room for business touch points to measure attendance, ticketing, concessions POS, and social media metrics. 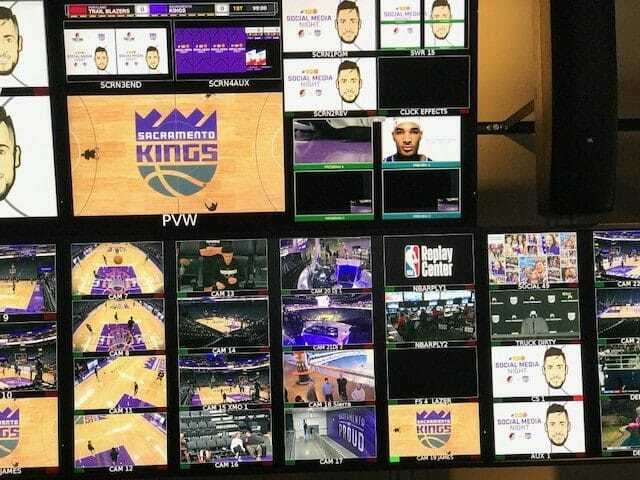 The Kings social media team ties into Control Room data and functionalities as necessary. The Control Room is also tapped into in-game feeds and live looks from the league which are posted across the massive network of Panasonic displays. Golden 1 Center cameras and police department city video feeds also stream on the Panasonic monitors here. Once inside in the floor area, 1,500 square feet of multi-level ribbon boards’ encircling the bowl pops out because of the dazzling Panasonic LED video displays. Social media content, team information and sponsorship-driven branding was on display for spectator enjoyment. The NBA’s first center-hung Ultra HD video board features 9 video boards and 6,000 square feet of coverage. The NBA’s first center-hung Ultra HD video board is a head-turner. It features 9 video boards and 6,000 square feet of coverage. The capper to this awesome piece of Panasonic technology is the dynamic centerhung ribbon board measuring 252-feet around with more than 1.6 million pixels. Center-hung video displays captivate fans with mesmerizing clarity showcasing in-game video, fan engagement, partner branding, and more dazzling content. From Social Media night content, to Snapchat geofilters, to Kiss Cam, to the Noise Meter, to promotions about upcoming games and venue shows, this giant video display was both easy on the eyes and so lifelike, viewers tend to watch the video board more than the live action. All total, there is 13,191 total square feet of installed Panasonic LED video displays creating live looks and instant replay viewable from any angle. 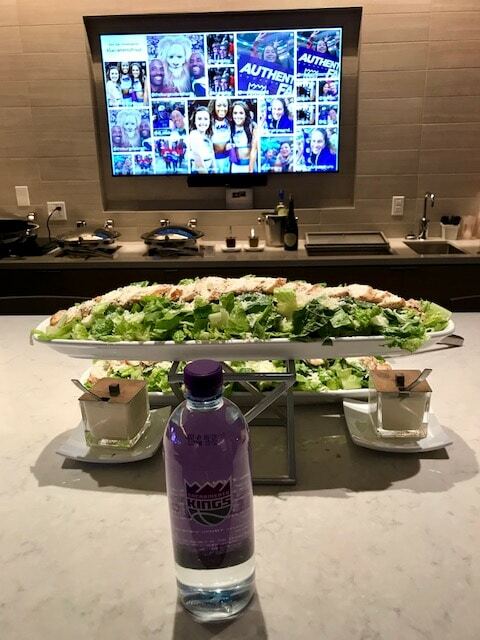 We ended the tour in a luxury suite stocked with good food and tasty beverages for folks on the tour and guests to enjoy while relaxing to watch the game and socialize. The center-hung video board was practically right in our face at suite level making it easier to see game details you can’t see with the human eye. The suite also featured beautiful Panasonic monitors synced to control room content. From the suite I then conducted interviews with Monaco, Darrin Gross, Senior Director, Partnership Marketing & Business Development for the Kings, and Rob Zeller, Executive Director of Connected Solutions at Panasonic USA. Question 1: I first asked Monaco about what makes the building special. Q2: Monaco emphasized the word ‘spectacle’ as a term that Vivek uses constantly so I queried him about what that meant in terms of Panasonic and other technologies. Q3: How was is working with Panasonic? Monaco added, “I called Richard Bower of Panasonic, 24/7. I’ve called Bower at 3 am and said I need this and one hour later I have an e-mail and the next morning there is a team from Panasonic at the front door of the arena waiting to meet me in the morning. They are definitely engaged, definitely listen to what we want and that’s what makes them special. Q4: I finished up asking how all the Panasonic technologies work together and independently. Right away, the 700 Panasonic HD Pro monitors installed throughout the arena concourses and suites were in full display here and throughout the amazing venue displaying digital signage, enticing social media night fan generated posts and targeted brand messaging by partners. Q1: I began by asking Darrin what the Panasonic partnership means to the Kings. Q2: What does ‘Spectacle’ mean coming from Vivek, one of the team owners? Q3: I asked Gross about Panasonic’s installment of the various technologies at Golden 1 Center. Q3: Gross responded, “The Installment part of video board, from a partnership standpoint, we ran point on the deal with Panasonic. From a technical aspect, my team had very little to do with it. But we were in touch with Scott Monaco and Ryan Montoya (CTO) so they understood what we were looking for from a partner standpoint. The fact that we have animation available on everything now is amazing. The fact that that it is easy for us to switch out messaging when you have static boards you can’t do that. We let them know what we were looking for to make sure we could effectuate the packages we sold to our partners. Q4: What have the Kings learned about Panasonic technology and the ROI moving from year one to year two of the amazing facility? Gross added, “We could have never done that at Sleep Train Arena, then again it is no knock on Sleep Train, Sleep Train is just an older building, to be able to do those sorts of things. If you were able to talk to our marketing team, they would say the same thing. The ability to promote our messaging the way we are able to promote our messaging here, second to none, it’s great. “I hope you are bringing people through here to show them this, this giant TV. It’s nice, it’s fun. It’s just such a difference from being seven miles north to here and our fans appreciate it,“ said Gross. Q1: I asked Zeller if the Golden 1 Center video board was maxed out in terms of size. Q2: How did the sales cycle with the Kings compare to other Panasonic installs such as SunTrust Park in Atlanta, home of the Braves. 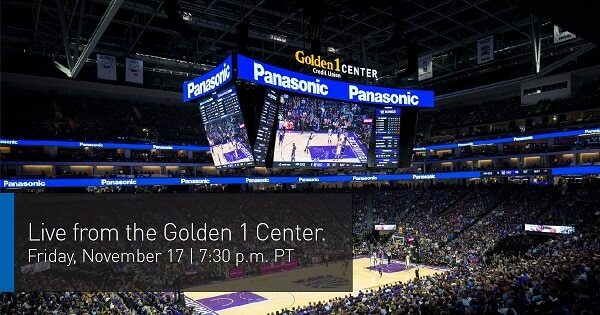 Q3: How did Panasonic Solutions help with the audio at Golden 1 Center? Q4: What type of unique challenges did Golden 1 Center present? Q5 How does Panasonic USA brings the connected experience all together? A5: With the stadium having all the different digital assets within the stadium, from the displays to social media, to the control room, getting feedback from fans social media wise, we had to work with the team in understanding what they wanted to deliver for a show, that is where we sat back and our team did a great job with the solution and control system that would allow them to take in all that data and then be able to disperse it individually to the different areas in the facility, The connected experience is what really immerses the fan and raises their value when they come to a game. Q6 Describe the ROI Panasonic tech provides in terms of incremental revenue versus sponsorship sales revenue. Q7: Are bigger video boards trending? A7: “I think so, it’s been the trend. Everybody always has to outdo one another; I think the boards will continue to get bigger. I think they will become more and resolutioned. Bigger, brighter and better, I think it will just continue to grow,” said Zeller. Q8: Finally, I wanted to know what type of business development was on Zeller’s plate looking into the future with sports and entertainment as well as commercial field work. A8: Zeller said, “We are all recognizing that they need to compete with online shopping, so how do commercial retailers, stores raise the experience for people coming in the store to shop. Now it’s all about how to take technology into retail. To end the evening, I hosted a Facebook Live from the Panasonic USA Facebook page during the game against the Portland Trail Blazers taking place on David J. Stern walk. To finish up this epic social media night, I hosted a Facebook Live on the Panasonic USA page. I was not really nervous but after traveling across the country and taking the extended tour, I needed to ramp up and be on point for this first time fan experience for me across Facebook. With the help of Kevin Leonard, Video Production Manager, Marketing Communications at Panasonic USA, and Kayla, I was told this Facebook Live was a success. Our Facebook Live session lasted 5 minutes and was seen by I believe more than one thousand fans located around the world. I started off outside Golden 1 Center to show viewers the two large displays by the plaza in full operation. Our video crew quickly entered the security gate and immediately came upon the ribbon board displays and stunning center-hung display as we overlooked the basketball court and seats. I asked a fan walking by what he thought about the video board and was given a positive review. I also fielded a fan question/comment asked over the Facebook Live platform. Filming finished up with a look at all relevant Panasonic technologies near me. It was clear the Panasonic video board gives the game another dimension, bringing new life to replays, highlights and stats, fan engagement and partner activations, like never before. The Golden 1 Data Center and the fully integrated Control. Kings Unveil World’s First Dedicated Esports Training Facility and Content Studio Inside Pro Sports Venue. A special shout out goes to Kayde Spilde, Marketing Director at Panasonic USA, the Panasonic USA social media team, Text 100, and the AGAIN Interactive team, for all the hard work they put into making sure this sports tech-driven fan experience for me and the Sports Techie online community was done right. I also wanted to thank everyone I met throughout gameday and my stay for their friendliness and support. I wear my new Nike sponsored Kings swag with honor. Next stop for me was CES 2018 in Las Vegas as a social media influencer and industry expert on behalf of Panasonic along with four other respective subject matter experts. Watch the Panasonic video below featuring me to find out more about Smart Sports Venues. Cutting edge technology certainly helps to get NBA fans out of the home and into the arena. Seeing your picture or social media post on the video board at Golden 1 Center is priceless. Panasonic technologies are engineered to surround fans with an unforgettable immersive fan experience, one they’ll want to come back for again and again. Btw, the Kings defeated the Blazers. Winning has no substitute for drawing fans to home game. My gratitude goes to Panasonic for the opportunity to learn about their best-in-class technologies at the Golden 1 Center. If you want to learn more about how Panasonic is creating immersive experiences, check out PanasonicMovesUs.com.